For all those who would be critical of protesters like Jonathan Moylan, let's zoom out to the big picture. 'Jono', as he is called by his friends, was given a suspended sentence last Friday 25 July. The previous day, Professor Sinclair Davidson took him and other environmentalists to task in The Conversation with 'Environmentalists have a right to protest — but not at all costs'. Davidson also had a go at the campaign to divest from fossil fuels. In January last year Moylan circulated a media release purportedly from the ANZ bank that announced ANZ's withdrawal of a $1.26 billion loan facility to Whitehaven Coal for its Maules Creek coal project. While this was an act of fraud on Moylan's part, he was not unduly penalised because the judge understood that the hoax press release was not about personal gain, but a desire to protect the planet from Whitehaven's new mine. When it comes to deception, let's compare the beam in the eye of the fossil fuel lobby with the splinter in Moylan's. Even apart from the findings of the Independent Commission Against Corruption, it is well-known that companies regularly agree to environmental protection conditions to win licensing approvals, then fail to fulfil their commitments. It appears that Whitehaven Coal provided inaccurate information to the NSW State Government regarding the like-for-like forest offsets that were necessary for the project to be approved. Independent ecologists have found that 'the majority of the offsets are not, in fact, box-gum woodland at all ... even the areas that are box-gum woodland are so degraded as to be very unlikely to ever reach a high quality status again.' Yet forest clearing continues and no penalty is imposed. Likewise, even though the company committed to respecting the cultural rights of the Gomeroi traditional custodians of the area, to date, seven of their 11 sacred sites have been bulldozed. To add insult to injury, the Gomeroi are locked out of the forest even for funeral ceremonies. Back to fossil fuel companies more generally and there are modus operandi which are quite legal but nonetheless ethically highly questionable. 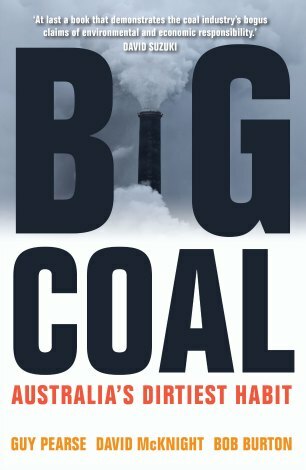 These have been detailed by former political insider, Guy Pearse, and his colleagues in their 2013 book Big Coal: Australia's Dirtiest Habit. For decades, the fossil fuel industry has quietly poured vast sums into supposedly 'independent' climate denial think tanks such as the Institute of Public Affairs in Australia, the Global Warming Policy Foundation (UK) and the Heartland Institute (USA). Large numbers of influential political lobbyists here and overseas are employed to ensure legislation is passed which limits support for renewables and maximises profits for fossil fuel companies. Attempts at regulation are met with public campaigns against either the regulation or the politicians pushing for it. We saw this with the unheralded campaign against the mining tax at the last election. When Davidson is critical of environmentalists for 'failing to convince voters', this is what we are up against. In Australia, the public has been led to believe the mining sector creates jobs. The truth is, oil, gas and coal combined employ less than 1 per cent of the workforce. There would be many more jobs in tourism, renewable energy, energy efficiency, public transport and manufacturing if mining wasn't so politically privileged. Regarding divestment campaigning, if anything, we need to protect those means by which ordinary people can organise to resist the distorting influence of the fossil fuel industry on our economies and political systems. Let's now re-examine the actions of environmentalists. I speak as an insider, but happily not a stereotypical one. I am a grandmother of six, a practising Catholic and for some years was our local Catholic youth group mum. I was drawn to actions at the Leard Forest because other ways of protecting the future for my grandchildren were proving fruitless. Any perception that environmentalists are 'coercive', feel they have 'an unlimited license to protest' or, worse, are 'violent', as alleged by the CEO of the NSW Minerals Council, are simply false. These claims do not mesh with my direct experience of the protestors at the Leard Forest or of environmentalists generally. Having stayed with the protesters and seen them in action, I have been impressed with their disciplined dedication to an ethic of peaceful non-violence. They are locking onto equipment, blockading or perching high in tress, but the risk is only to themselves, not to others. It is not 'violence' to take these kinds of actions even if they frustrate the mine workers and annoy the police. All plans for action are measured against principles of respect for all persons, including the police and workers. Any new people to the camp are drilled that vandalising property is unacceptable. Sexist or racist jokes are not tolerated. Drugs and drunkenness are out. Everyone must help with the work in the camp or on the farm. If citizens of democracies are no longer allowed to organise either civil disobedience or divestment campaigns, as suggested by Davidson, God help us. The ballot box on its own does not create a robust democracy, and it certainly hasn't proven able to rein in the power of the fossil fuel lobby. How much weaker would our democracies be without a range of means by which to champion the common good? Well said Thea! It's great to read some well reasoned truths as opposed to lies, half truths and propaganda.....if only there was more of it, particularly in the mainstream media! But they must be dangerous. That's why protest is about to be criminalised in Tasmania - to protect the.... Forest and mining industries, so weak and powerless. Thanks Thea for this timely piece! It's worth noting that Professor Davidson is a senior fellow of the IPA, whose major funders over many years have included fossil fuel companies and big tobacco. His piece in The Conversation is also in breach of their guidelines since he is writing outside his area of recognised expertise. Thank you, Thea, and keep up your good work. Thea, thanks for presenting this environmentalist perspective. We have responsibility to protect the environments on which we depend for what we need to live. Maybe it helps being a grandparent or elder citizen to appreciate the choice we need to make between living a one dimensional life of seeking profit and advantage, and living in a generative way that protects life not only for one's own lifetime, but the life of future generations. Thanks, too to Jonathan Moylan who is one of many who have made this choice early in life. I agree protest like hell about Abbott and the "COAL"...ition.,and the Climate Change deniers..But it just may be sinful to cost them millions....just maybe?. The direct employment numbers are irrelevant with the vast majority of work mechanised (to stay competitive) and contracted. In 2013, 860 Australian Mining Equipment, Technology and Services (METS) companies were surveyed by Austmine. They employed 386,000 Australians and generated $90 billion in revenue. Some 84% of the companies surveyed are Australian owned and they exported goods and services worth $27 billion that year. Clearly, the oil, gas and coal industries extend well beyond 'less than one percent' of the Australian workforce. In Queensland in 2012-13, the gas industry spent $11.8 billion and the coal industry $24.6 billion on wages, goods and services and local communities. I am still to see a plan that helps a state like Queensland - where 20% of jobs are tied to minerals and energy exports - transition seamlessly to a Utopian existence. Thank you Thea for a first hand account. Two of the young men involved in the protests are members of my church,and I also admire their non-violent but persistent approach. Gary Doggett, on those figures, the METS companies still only employ 3.5 per cent of the workforce. Renewables and energy efficiency have much greater potential for employment creation than does coal mining. For example, in Victoria renewables employ three times as many workers in Victoria as does coal mining. Also, if it is "Utopian" to want to see a world which is not too degraded from the world we inherited, when we are capable of making this possible, then call my hopes "Utopian". Thea, you know I am on your environmental side. I have spent decades teaching youth about these issues and involved in ACF on ground with so many similar supporters. So I wonder who you are referring to when you say you are not typical? I also have to in conscience question the wisdom ofcivil disobedience in general and in the light of our current political regime. It begs the question of course. But Jonathon's actions have only served to polarise not galvanise the general community. Call me old fashioned but working within albeit aggressively and not without the law will in the end reap the longer returns, I believe. Solidarity for fhe Cause if not for the Means. People protest for various reasons unfortunately self interest seems to be their main reason. I don't agree with most of Thea's article and I certainly do not support the actions of Jonathon Moylan. Brian, You have made a very good point about environmentalists being motivated by self interest. They care about their future, their kids' future, their gandchildren's future. They never care about the banks, or the billionaires who are trying to make an extra few bob cutting down trees and digging up the country. Bravo! Civil disobedience has a long and successful history of providing justice to the poor, disenfranchised and the otherwise powerless, when our governments and their wealthy overlords refuse to consider basic human rights. Unlike Martin Luther King and Ghandi who believed in non-violent protest, the anti-human rights lobbyists use police, army and mercenaries to enforce their short -sighted pursuit of self-interest and greater wealth. A healthy environment,a respect for sacred sites, education and many more employment opportunities in Australia must be championed. Our moral obligations and future depend on it. Brian said: "People protest for various reasons unfortunately self interest seems to be their main reason" I've met hundreds of people involved in protests and I'm yet to meet one whose primary reason was self-interest. Protest can sometimes be quite costly. The vast majority of people do it for the sake of others, of justice and of seeking a better world. It is hard to see renewable energy ever taking over as people turn into NIMBYs when wind farm locations get mentioned, let alone a solar array big enough to power more than a small town. And perhaps if the forests hadn't been cleared by farmers, there would be more to offset the mines.